Through 2013 and 2014 plans for the development of Swanscombe Peninsula were released by London Resort Company Holdings (LRCH). The proposals centre on plans for ‘London Paramount’, an entertainment complex devoted to a completely unnecessary ‘Paramount Pictures’ Theme Park complete with Hotels, Shops and massive related infrastructure works. The developers suggest this will bring in 15 million visitors a year. Construction is scheduled to start in 2016 with an opening in 2019. The planning application is scheduled for autumn 2015. With a planning boundary set in excess of 500ha, around a heavily developed ‘core’ in the middle of Swanscombe marshes, the impact of this project will be catastrophic to the local environment. On a landscape scale, this development erases one of the last sizeable areas of marshland in the Lower Thames corridor. 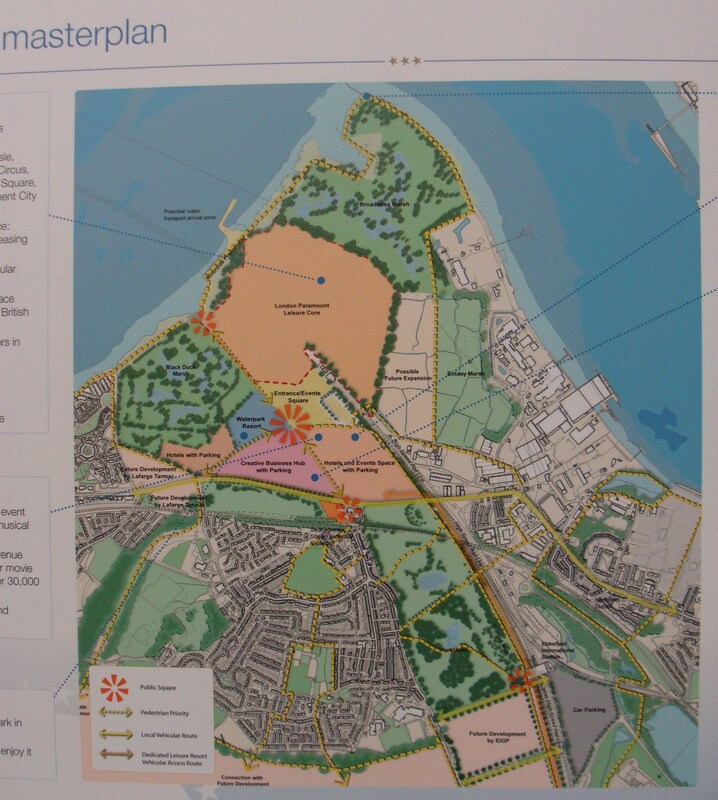 Existing plans propose to keep isolated fragments of Swanscombe, Botany and Broadness marshes but with the needless addition of ‘country park’ style ‘habitat improvement works’ out of context with the site’s wild character. This is green-wash on a dramatic, unwelcome scale. Aside from the unmitigated loss of habitat/connectivity, space, species diversity and population numbers, there will be a loss of entire species altogether. The environmental issues resulting from an influx of visitors on the scale predicted, including air pollution and noise pollution will have long term consequences for the wider area. Swanscombe Marshes should remain a place for wildlife to thrive in and for people to enjoy. The long term value of this site as it stands, far outweighs the short term follies of an unwanted, privately-funded Theme Park in our beautiful Garden of England.